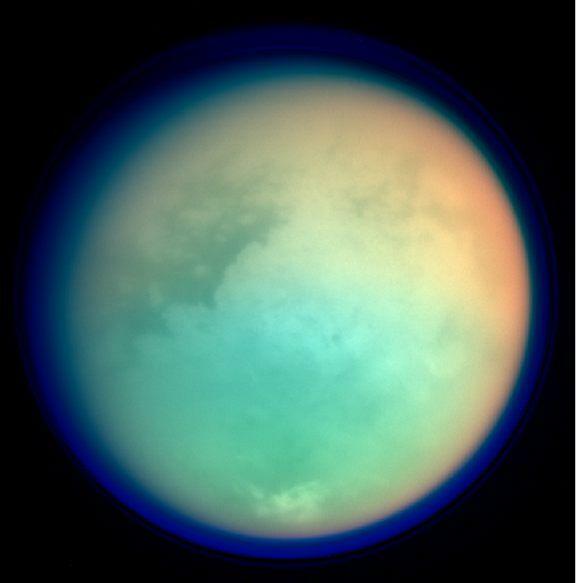 Explanation: Normally hidden by a thick, hazy atmosphere, tantalizing features on Titan's surface appear in this false-color view. The image was recorded as the Cassini spacecraft approached its first close flyby of Saturn's smog-shrouded moon on October 26. 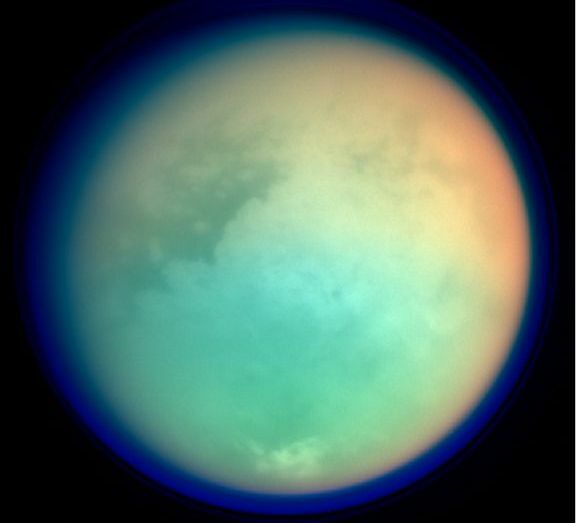 Here, red and green colors represent specific infrared wavelengths absorbed by Titan's atmospheric methane while bright and dark surface areas are revealed in a more penetrating infrared band. Ultraviolet data showing the extensive upper atmosphere and haze layers are seen as blue. Sprawling across the 5,000 kilometer wide moon, the bright continent-sized feature known as Xanadu is near picture center, bordered at the left by contrasting dark terrain. Saturn orbiter Cassini and Titan lander Huygens plan further explorations, but for now the origin and nature of Titan's surface features remain unknown.